Work can be quickly and correctly set at any angle with these adjustable swivel angle plates. They are graduated for setting 0 – 90° and can be easily adjusted manually and locked in adjusted position by means of two locking nuts. For setting purposes, a degree scale, reading minimum one degree, is graduated on the boss itself. This ensures better setting accuracy. The swivelling face in the swivel angle plates is provided with T-slots machined from solid. Other face is provided with as cast cored slots for clamping the angle plate on machine table. 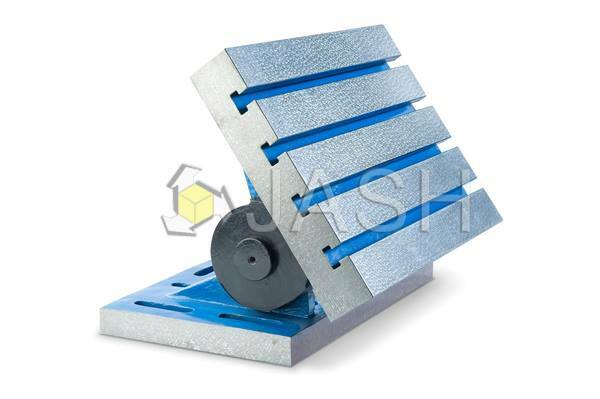 Made from close grained plain cast iron conforming to grade FG 220 of IS 210 (equivalent to GG20 / FT20 / 30-A). Higher grades also offered on request. Working faces flat within 0.015 mm per 300 mm and square and parallel within +/- 0.05 mm per 300 mm in two extreme positions. Offered in sizes as shown in the table.